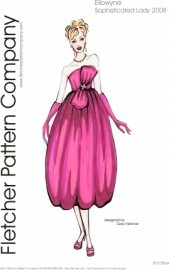 " Sophisticated Lady " design by Gary Fletcher for Ellowyne Wilde. This pattern features an empire waist with front darts under the bust, gathered waist and hem, back zipper closure and is trimmed with a front bow and pendant. The PDF version prints on A4 and 8 1/2 x 14 legal size paper. This is the printed version and includes pattern envelope with cover illustration.